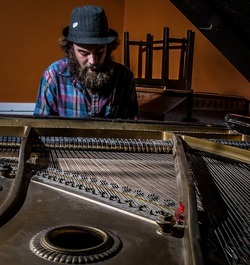 Alex Gideon - has been playing music since the age of 12 when his brother first showed him some basic chords on guitar.., since then the music hasn’t stopped. 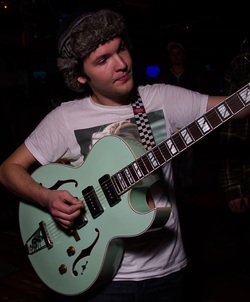 Born and raised in Syracuse New York, Alex has played in various upstate bands throughout his teens. Over the last 2 years Alex has been the frontman for the Upstate jam band, King Koala. With the new project, The fat Peace he plans to showcase more of his lead guitar skills and overall go a more experimental route. With rip-roaring tasty licks that resemble those of Sublime guitarist Bradley Nowell sprinkled in with some Grateful dead influenced riffs, Alex is sure to bring a unique sound to his audience as well as his always catchy and inspiring lyrical saga’s. Brian Darby - is one of the bands recent additions. He hails from Syracuse NY, a JD alum along with alex and jamie. Darby has been playing in various bands around Upstate NY the last couple years. His musical backround includes drumming as well guitar and his style is a unique progressive jam which has helped add to The fat Peace's ever changing sound. Rob Hydell - is Originally from Long Island and has played in numerous bands through out NY since his teens. Rob has also spent over 3 years learning jazz bass in college. 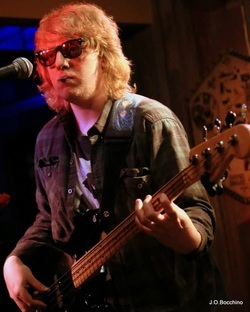 After playing most recently in The Rob Hydell Trio (NYC) and Mantraverse (Binghamton NY) Rob now brings his funky stylings to Syracuse as the new bassist for The fat Peace. Jamie Bird - Hailing from the same high school as frontman "Dunks", the two old friends have reunited when Jamie joined The fat Peace. After navigating his way around the Upstate NY music scene for the past 2 years as the drummer for the recently disbanded Jam band Project Weather Machine, Jamie is now continuing his musical journey as the drummer in The fat Peace. Jamie's unique jam beats are sure to influence and shape the band's growing sound and Upstate music fans can now continue to groove to the back beat that they've grown to love.